It’s good to have memories, especially happy ones. If I smell pipe tobacco, I think back to both of my grandfathers. I have an old powder compact given to me by my paternal grandfather several years before his death in 1974. It’s empty and tarnished now, the mirror inside pitted with age, but the outer engraved rose pattern is still visible. He loved roses, and whenever I see a lilac rose, I think of him. I don’t smell pipe tobacco very often these days, but when I do, I have to stop for a moment to savor it. My grandfather smoked a pipe too. It is those little things. Likewise, which is probably why it jogs the memory so poignantly. Beautiful post. Sad how bitter things can get. I don’t understand. I have a little elephant of my grandmothers and it makes me smile everytime. It’s nothing fancy, gosh I think it might even be made of some type of plastic, but it’s mine now with all it’s history. Thanks. It is sad. I wish, especially for younger people, it could be a group effort. You never know what little thing will trigger a happy memory for someone. My husband’s grandmother used to keep a small figurine of a mouse and boot by her bedside that was I think her husband’s nearly only childhood relic. Certainly nothing fancy, but it meant a lot to her. Big hugs! I know what you went through. The exact same thing happened after my grandfather passed away, three years ago. My grandparents raised me and it was sad just seeing his kids come in, taking stuff they once bought him, or throwing away things or donating things to the goodwill that they didn’t find any use for. It was like seeing parts of him disappear forever. There does come a time when cleaning out has to begin. I understand it. It’s hard to see things go to the trash or Goodwill. My husband and I helped clean out his grandparents’ home when they moved to assisted living. I’m so grateful that we took what little stuff we did. I took a big glass jar that she kept her flour in. Now every time I get out that heavy jar of my own flour, I think of her. It’s sad that for many of us, we lose our grandparents while we’re still in the ‘it’s mostly about me’ phase. We love our grandparents and have fond memories, but we often don’t wonder about them as people–people with pasts and wonderful stories–until it’s too late. At least that was the case with me. Most of my grandparents died before I hit my 30s, which is too bad. How I’d love to be able to go back now and spend a day with each of them, asking the questions I should have but never did. With the ring, I was still young and I just knew that’s what she wanted me to have so I badly wanted it. I knew it was her gift to me. Everything else was picked over. I remember walking through her room and pointing to things that I liked, that would remind me of her. I had spent so much time there. But the answer was always that someone else was getting that. At 18, I didn’t really think to look at dishes, like the milk glass that I so love now, probably because it reminds me of her. And it may have already been taken. What a beautiful post. It brought tears to my eyes. I agree with you. People are too greedy. Although my dear old grannie is still holding on at 91, she was placed in a group home setting a year ago. At that time everyone started going through her treasured belongings. I got lots of Christmas Decor she had gotten for gifts, but most of it had no meaning. I did however get her fancy antique handheld mirror. I remember her using it when she would put her rollers in her hair and “set it” every other night. I also got some of her canvas she made. I will cherish these things forever. My grama is to the point she is barely awake, and if so she doesn’t open her eyes. It kills me to see her like this. She has the bluest eyes ever. All I want is one more look into those eyes, one more smile, one more hug, one more I love you. I don’t think I will get this. 😦 I am glad you got the ring. I can tell by your post, your heart is genuine and you won’t look at that ring or the mason jars as money in your pocket like many, you will relive memories in your head which is what that stuff is supposed to be all about. Have a great weekend. I don’t know all the details of what went on 20 years ago, but I know enough that it changed me then to decide that things aren’t important. If I end up with nothing, it’s OK. I still have the memories. I hope your grandmother opens her eyes again for you. I know how important “one more” would be. Makes me think of my own grandmother (maternal) passing. She was beloved by all. When she passed, I got something – a nick nack. It was these people sitting on a bench and it was the first thing I could see when I looked through her apartment window. I was not the only family member who wanted but was so happy when I actually did get it. What’s Nehi? Oh. Only the greatest fruity soda on earth. My grandparents always kept their fridge stocked with tall glass bottles of them. I used to sit with the fridge door open trying to decide which flavor I wanted. Cherry and grape were my favorites. I’d get the whole bottle and then belch the afternoon away. Nothing better to a six-year-old. I still see it around from time to time. Must be a Southern thing. Beautiful, Karen. Really. Those things really do so much to help you accept a loss (because I don’t believe you ever get over it). But be careful with them — especially since those are breakable. The last Christmas present my sister Judy gave me, less than a month before she died, was a Bill Clinton Draft Dodger — it’s a stuffed version of Bill (who was president at the time), with long stuffed legs. You put it on the floor in front of a drafty door, spread his legs, and it blocks the draft. It’s hilarious. I found it in the trash can about two weeks ago — Bill is rather weathered after 14 years … and I burst into tears. My husband had forgotten and decided to pitch him. So I moved him to the one area I know John’ll never touch — a corner of my closet. Now Bill Clinton leers at me when I dress! So glad you saw and rescued Bill just in time. We never know what things connect us to our loved ones. You’re right, I don’t think we ever get over it. It’s been twenty years and I always think how much my grandmother has missed in my life and what I never learned about hers. But she helped make me who I am. So beautifully poignant. It brought back lovely memories of my own grandparents. This is a beautiful post. It is sad that sometimes the worst in certain people comes out in these types of tragic situations when we need the best to shine through. I’m glad you were able to retain such a meaningful reminder of your grandmother. Thanks for sharing. Two things this grandmother and I had in common were cooking and family history. So I’ll always have other ways to remember her. That is so special to have those bonds with our loved ones, even after they are no longer with us. That was a beautiful post! My mother is an only child, so we didn’t have any trouble dividing up the estate when Grandma died. I never realized what a blessing that was until recently! One of my good friends had cousins stealing vacuums out of the house before their grandmother was even buried. Tacky, tacky, tacky. So does calling first dibs! Thank you. It’s been good to get some perspective and some closure. Such a beautiful piece. I relate to this so deeply. I hope your memories of your time together will last a lifetime. Thanks. I know they will. And now you can add to the memories. That’s really cool. Beautiful! It’s not the monetary value of the things our loved ones leave behind that matters most. It’s the feelings and memories those things evoke in us. I still use my mom’s wooden spoons daily in my kitchen, and feel like I’m stirring a bit of her love in every dish. My mother-in-law has an old wooden masher that was her grandmother’s and some old wooden springerle molds of her mom’s. There’s nothing like cooking heirlooms, you’re right. Even recipes. Beautiful post, Karen. You do such a wonderful job with detail to place the reader in the story. As soon as I read “Nehi,” I was six years old again and pulling a 32 oz Orange out of a floor cooler at our country store. And I’ve seen more Mason jars than I can count. Ohh so sad and true. When a family member dies, things can get really ugly. I hate that it seems for some love becomes about money and what’s deserve red or not. It’s ugly. I love your mason jars. I know this all too well.. my grandmother died in 2008 and instead of putting it in her will, she told me before she died I could have her jewelry when she passed, and after she passed- i wanted a piggy cookie jar she always kept cookies in for my brother and I. When she passed, the cookie jar suddendly disappeared and supposedly nobody in the family knows where it went… and my aunt got dibs on the jewelry before I did..I got the left overs of what she didn’t want… sad…. i def. agree this is a beautiful tribute though. and I’m sorry for your loss. It is hard. I learned the first time that the best thing to have is memories. Everything else is a bonus. I hope you found something that reminds you of your grandmother. Karen! You can write, mama! I’ve lost my grandparents although I can’t say I was close to them too much, so I didn’t associate items with memories. However I do think about the dynamics of divvying up items after a person dies. I think about my own death, and how the last thing I want is for my kids to fight over something. I think about my mom’s passing and also hope that the bond my siblings and I have will outlast any sort of grievances and greed. I think that’s what’s more important to me: to not be this greedy person with my sister when the time comes. And I hope my kids don’t ever get that way. In the end, it’s just things. Aw, such a nice tribute to your grandmother. 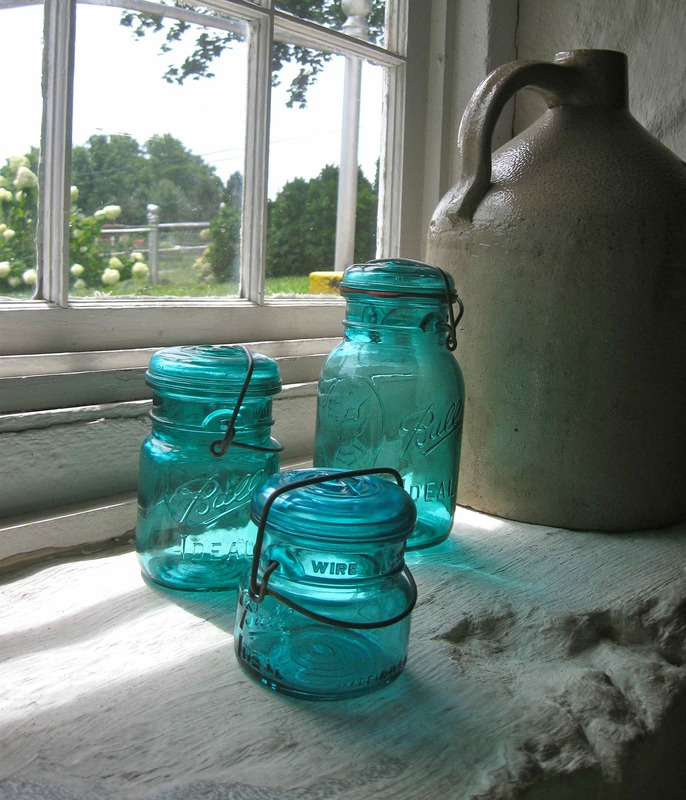 Those are perhaps the most beautiful mason jars I’ve seen! Glad you’re displaying them. It takes me back not so long ago when my own — I’m her name sake — died before she could meet my newborn son. When I arrived for her funeral service, aunts and cousins had already picked over EVERYTHING in her house — it was practically empty. Like a pack of thieves had hauled everything away, and it made my heart sink. I too hope my kids don’t do that to each other when I’m gone. There was one chair that no one wanted because it squeaked and had gaudy fabric. I gladly took it (and simply painted the room and decorated to match it). I also took her biscuit cutter (which I still use!) and a couple of things that she had knitted (my son sleeps with an elephant). It’s the small things I treasure most, but I still love to sit in that chair from time to time and just…think of her.